Google's YouTube is becoming a major source of Sunday School lesson media. Fueled by a combination of user-created and publisher-provided content, along with it's low-cost and widespread availability, YouTube is poised to become "the source" for Christian media. It's also becoming a source of "hard to find" (or hard to get) resources. ...and fun material produced by other Sunday Schools and people like us. Here at Rotation.org, members and lesson writers are finding more and more good teachable media on YouTube and linking you to it in our lesson forums and Writing Team lesson sets. This article is written to alert you to this growing trend, plus, share tech "how-to" for accessing this online content in the classroom. Not a problem! We have described several solutions for teachers, including, how to use your cellphone's internet connection, and how to download video for offline viewing. 1. Bible videos abound on YouTube. Looking for a Jesus video that does a good job of covering "that" story? You'll likely be able to find them and compare them on YouTube. Bible content is not always easy to find on YouTube, due in part to how their search engine works, and how some users don't correctly "keyword" their posts. That's why we at Rotation.org are increasingly posting links to YouTube "finds" in our Bible story forums, and encourage our members to do the same. It's the power of "crowd-sourcing." How can YouTube legally host all this copyrighted content? Because the publishers are beginning to embrace YouTube as a distribution/advertising channel. 2. More publishers embracing YouTube as a distribution channel or repository. Yes, some Christian publishers are literally "giving it away" on YouTube or at their websites. The new Bible Superbook Video and the non-denominational "Life of Christ" series produced by the LDS Church are good examples of that. The free Gracelink.net's animated Bible videos they produced for a previous curriculum are another great example of some publishers' desire to simply share their content. YouTube is becoming a "distribution channel" for publishers who don't want to host their videos on their own sites. Videos take up space and slow down local servers, so hosting on YouTube and linking to it on your web page is the trend. Some publishers are posting to YouTube to keep their videos available, as other distribution channels dry up (like Christian bookstores). And more and more independently or denominationally funded publishers are simply giving it away for free. Example: The dozens of animated and ecumenical Bible shorts produced by the SDA church's "Gracelink" ministry. They are BURIED on YouTube (and their own website), and hard to find by keyword, ...unless you know how to look or someone has given you their URL like Rotation.org! Good older videos don't die after they've gone out of print (or the production company has disappeared), they just go to YouTube. 3. Teacher Training. Here at Rotation.org, we increasingly reference "how to" videos in our lesson topics. Art, baking, games, --you name it, someone has created a helpful "how to" video about it. In an art lesson the Writing Team wrote, we linked a "how-to easily make a God's Eye" video in the lesson for Millenials who didn't grow up with this craft in Sunday School. In that same lesson set, we linked to a "how to easily make your own Stomp Rocket" video for the Science workshop. So much easier to "show them" than explain it in paragraphs. If a picture is worth a thousand words, a video is worth 10,000. In fact, we often look at videos to learn new techniques that inspire to think of new ways to creatively and memorably teach God's Word. You can find teachers and pastors talking about virtually any Bible subject. While they may not be your theological cup of tea, occasionally, there are some amazing GEMS from unexpected sources. For example, we found a Mormon pastor issuing a call to discipleship that was truly inspiring, and linked it in one of our Writing Team lesson sets. Even if you chose not to show it to your kids, it was great inspiration for teachers. Rotation.org is paying attention to what's out there because we are a web-focused, ecumenical Sunday School resource that has always loved creative media. To help us find things, we have the power of thousands of members looking with us. Other curriculum websites and publishers don't want you leaving their site to visit YouTube. They want a captive audience only looking at their products and advertising. Rotation.org doesn't have ads and our mission is to point you to great content wherever it's found. 4. Christian music continues to evolve (and get better), and most artists put out music videos that you can discuss, YouTube is a great place to get exposure to all type of Christian music. Like Pandora, the "mix" that YouTube will present helps you find new artists. 5. YouTube is a vast community of people creating home-made, and semi-professional quality videos, in addition to publisher quality material. You'll find that kids and teachers are already posting their demonstrations, skits, devotions, and "how-to." These can either be used as instructional pieces or inspirations for your own video-making projects that kids can access from home and share with their family. YouTube is a great place to see science experiments and magic tricks you can adapt for Bible lessons. YouTube is a great place to see what other churches are doing to promote their ministry and mission projects. There are many ways you can display a YouTube video in the classroom. In brief. 1. Plug your internet-connected smartphone into an LCD projector or Smart-TV (one that has an a-v connection). This also has the advantage of using your smartphone's internet connection if you have a good signal. All you need is an HDMI adapter to plug your phone cord into the HDMI cable that goes in the back of your TV. Read our article about the connector you'll need. 2. Plug your internet-connected laptop or tablet computer into an LCD projector or Smart-TV. Use an HDMI cable to connect between them. 3. Wirelessly "cast" or "mirror" your browser content to your SmartTV using Chromecast. Read our detailed article about ways to download and display YouTube videos. Read our related article about wirelessly "Chromecasting" your browser's content to your SmartTV. It's easy! How can YouTube, publishers, and copyright holders AFFORD to give it away for free? Another reason some publishers "give it away for free" on YouTube is that they have throttled the size and resolution of their posted material. They want you to like the material and then purchase the full resolution version (usually signaled by a popup ad). Surprisingly, however, many publishers upload good quality videos. Some producers are simply posting to YouTube so they don't have to worry about "losing" their material on some other site when that site goes defunct. And then there are those who are simply giving it away. YouTube's uploading and security make it easy for producers to post and manage their collections. See some example links to such resources in the next post below this one. Not all videos on YouTube are created equal. You may find two versions of the same clip, but they may be vastly different in quality. One may have great audio, the other may sound a bit tinny. One may have high resolution, the other slightly pixel-y. Factors that affect this appearance and sound include: the age of the original material, when it was posted (YouTube now allows higher resolution video uploads), and the publisher or uploaders desire to give you something that doesn't duplicate what's also for sale. If you find what you're looking for, and it's not as high quality as you need, keep searching. Searching YouTube can be a bit frustrating sometimes. (Which is why we at Rotation.org are increasingly posting our "finds." Unfortunately, the "keywords" you use to search for a video may not be the keywords the original uploader assigned to their video, or used in their title. In fact, I've found a number of video resource providers incorrectly titling their videos. (Gracelink.net's animated curriculum shorts are a good example of bad titling -which accidentally "hides" their videos on YouTube.) The trick is to be persistent and creative in your search attempts. Some of us can still remember when classrooms only had one electric outlet! Increasingly, internet connectivity is a "must have." 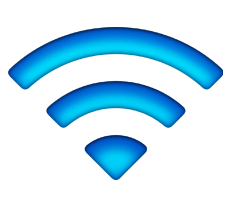 Churches who are installing WIFI for their staff and members, now need to make sure access is available for teaching purposes too in EVERY classroom. At the very least, your "Video" workshop should have an internet connection. It's as valuable as having a DVR and TV was 10 years ago. Fortunately, wireless modems and wifi "boosters" (if needed) are not expensive, and their cost will eventually be offset by your media budget savings (as well as the appeal to kids and visitors of your forward-thinking approach). Today's "Smart" TVs come WIFI and internet ready, often with their own YouTube apps built-in or available for download. If you don't have a "Smart" TV, you can make it smart (able to connect to the internet) by using a simple device like Chromecast or ROKU which accesses the internet for the TV, or by using your cellphone's ability to connect to the internet, and then connecting your cellphone to your TV. Most Smart-TVs and cellphones can connect to the church's wifi. If you're using your cellphone to connect to WIFI or your cellular internet, you can also connect your cell phone to any modern TV (even if it's not a "smart" wifi enabled tv) and show on your TV what's on your cell phone. Learn more. What we have in many churches regarding the internet in the classroom is a mental hurdle, not a technical one. They imagine kids surfing the web, which is NOT what we're suggesting. The use of YouTube should be teacher-controlled. And there are still places in the Church where multi-media is considered inferior content, or unnecessary for teaching the Bible, or they think kids already get "too much" media. The ignorance of those opinions are beyond comment. Suggestion: Show Them. Pick three or four different YouTube videos and show the powers-that-be what you want to be able to teach with. 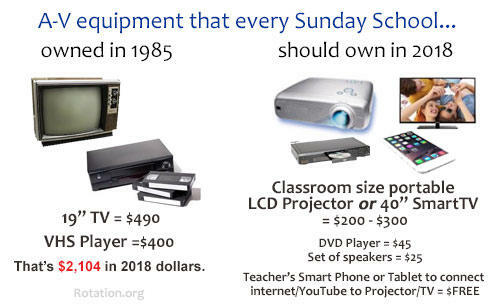 Then point out that ultimately the cost of extending the church's internet connection to the classroom will be made up by the savings in your media budget. They'll get it. If your church is still stuck in a pre-internet century, there is a way to download YouTube videos and bring them into your classroom for display on a computer, smart-tv or tablet. Read our "how-to" article. What about the "Theology" of YouTube Posted Content? We're all big kids here. Contrary to what the denominational offices and publishers want us to believe, we are smart enough to separate the sheep from the goats. And make no mistake, there are a lot of "goats" on YouTube. That's the price we pay for free access and an abundance of material. Preview and make your own choices. Note: YouTube is experimenting with an "ad free" paid version of YouTube, currently called "YouTube Red." As some ads may not be suitable for your classroom, it may be a good investment. That said, YouTube bends over backwards to make sure its ads are appropriate for the type of content you are viewing. Article by Neil MacQueen. Neil is a techie Presbyterian minister who regularly teaches with media and posts lessons and resources content to Rotation.org. You are welcome to post your insights below. If you have YouTube link to share, post it under the appropriate Bible story in our Lesson Forum. All of the following videos have been posted in our forums here at Rotation.org. 1. Thomas Nelson free "Read and Share" Bible Videos for Preschoolers. They've posted their entire series. 3. Psalm 8 Devotional Music Video featuring Train's "When I Look to the Sky." This was created for the Writing Team's Psalm 8 video-music workshop. 4. Many Christian artists have "official" lyric videos to their hit songs that are great for discussion. Here's one we used in the Writing Team's Pentecost Music Workshop and turned into a worship activity. 5. Saddleback Church's big collection of Bible story "shorts" for kids. 88 short animated Bible videos. Go to their channel on YouTube. This one is about Paul. 6. Here's a Game Instructional Video which our Writing Team creatively re-imagined for a lesson about Obeying God in our Judges set's Games Workshop. 7. Need to teach kids how to weave using a cardboard loom? Oh, there are so many more examples! for offline viewing when you don't have an internet connection? LOVE using YouTube as a resource in my Sunday School. We are currently doing a Pentecost series and are using the "Start a Fire" music video off YouTube as described in the Writing Team Pentecost lesson set.